Hey, y’all! Today I come to you extremely hungover (or am I still drunk?) 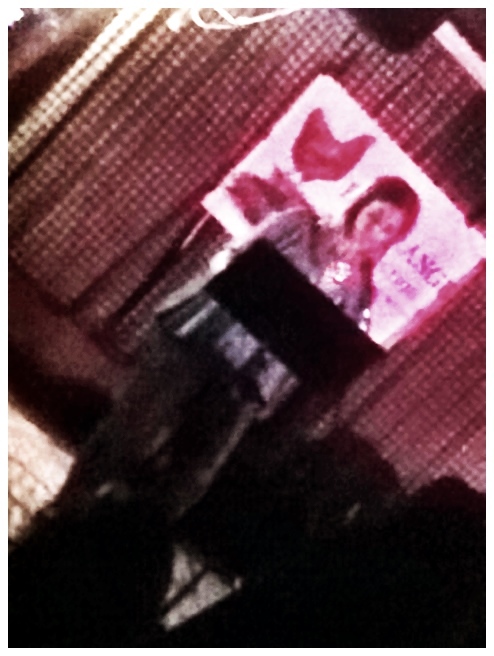 and elated after last night’s Freerange Nonfiction reading series. It was a real thrill to stand in a room and read some (frankly) really personal stuff (OMG I am an exhibitionist!) and an honor to be featured with such talented writers. It was a warm, lovely, supportive room of friends and strangers, and to the guy talking really loudly on the stairs while I was reading, I’m sorry I told you to shut up. (Well, actually, I’m not, because you were sort of a jerk, but everyone else, you were great!) Honestly, writers need all the support they can get (we’re a fragile bunch, despite appearances sometimes! ), so yay. This is a photo my friend snapped, and I think the blurriness properly evokes how I feel right now. That I ended my night wandering the halls and stairways of the hotel attached to my condo because my key card didn’t work and I kept accidentally ending up on the roof like I was in Lost or that Judy Blume book I loved as a kid where the girls get turned around in Central Park and realize it only after they notice the same tree for the fifth time felt somehow fitting to the surreal, hilarious, scary fun-ness of the night. Posted in Faves. Bookmark the permalink.